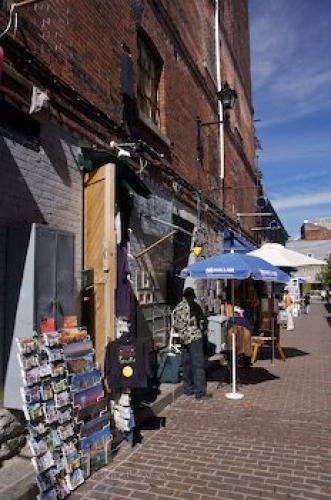 Artists set up stands along the Rue Saint-Amable in Old Montreal, Quebec that exhibits all their art work for tourists to browse through. The art work that local artists spend many hours perfecting are set up on stands along Rue Saint-Amable in Old Montreal, Quebec for people to buy. On sunny days you can watch artists at work where they have a chair and easel beside their stands so that there is never a wasted minute in the day and they can continue to produce more art work. Art work along Rue Saint-Amable, Old Montreal, city of Montreal, Quebec, Canada. Picture of stands that display beautiful art created by local artists in Old Montreal, Quebec.